L. Meisel, Photorealism, New York, 1980, pp. 276-277 (illustrated in color). L. Chase, Ralph Goings, New York, 1988, p. 22 (illustrated in color). Sacramento, The Artist's Cooperative Gallery, Views of Sacramento, 1969. New York, O.K. Harris, Premier Exhibition, October-November 1969. Savannah College of Art and Design, Photorealists, October-November 1997, p. 22 (illustrated in color). Vero Beach, Center for the Arts, The Photorealists, July-September 2000. Seoul, Samsung Museum of Modern Art, Illusion and Reality: Hyper-Realism Painting in Korea and America, March-April 2001, p. 107 (illustrated in color). Aarhus Kunstmuseum, This is America: American Photorealists, September-November 2001, p. 73 (illustrated in color). 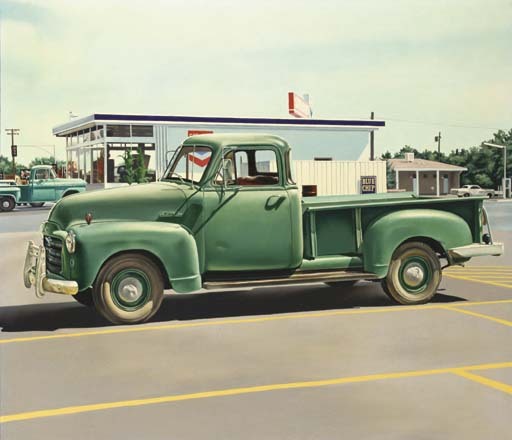 Ralph Goings' painting Blue Chip is the first example from his acclaimed series of Pick-Up Trucks, which he began in 1969 in preparation for the exhibition Sacramento Views. Goings, who until this point had been painting pictures that were heavily influenced by Wayne Thiebaud, was facing an impending submission deadline and did not have a painting that he wanted to exhibit. One day shortly before the exhibition, he resolved not to return home before finding the subject he wanted to paint. Walking through the parking lot in a strip mall in Sacramento, Goings noticed a crowd gathered around a brilliant black and shiny-chrome pick-up truck. The driver revved the engine and the crowd roared. This scene of shiny metal and human awe entranced Goings. Looking past this group, however, Goings saw another pick-up. There was no crowd around this truck. It was quietly parked. The truck was green and beaten up. It was like the truck parked in almost every driveway in Sacramento and Goings knew that he had found his subject. Goings quickly took snap shots of the truck. That day Goings found his inspiration and Blue Chip soon followed. This episode was the beginning of Goings' mature period and his emergence as one of the predominant practitioners of Photorealism. His subject matter came to encompass diners, fast-food joints, suburban parking lots, trailers, still-lives of ketchup and salt and pepper shakers and, of course, his most popular subject: the pick-up truck. Goings, along with Richard Estes, has led the Photorealists in what Linda Chase has described as the movement's "impulse encompassed by a desire to revalue what we as a culture find easiest to dismiss" (L. Chase, Ralph Goings, New York, 1988, p. 9). Goings' paintings, and Photorealism in general, share many of the theoretical and philosophical underpinnings of Pop Art, so it is fair to view Photorealism as a direct descendant of Pop. Blue Chip is painted as a portrait with a pick-up as its chosen sitter. In this there is an affinity to Andy Warhol's well known Campbell's Soup Can paintings; both paintings shocked audiences because the artists imbued so much gravity onto banal subjects. Following in this vein, Blue Chip makes heroic that great American symbol of ingenuity, perseverance, and western expansion- the pick-up. Blue Chip also finds parallels with Ed Ruscha's early paintings of the 1960s like Standard Station. Not surprisingly both artists are Californian and their paintings have a strong sense of the West in both their sensibility and light. Both artists are fascinated by and extol the wonders of the road and the American car culture that flourished best in the West. This new world of freedom, and the emergence of a culture of salesmanship that matched it in the form of billboards and the futuristic architecture of gas stations and fast food stands, defined America much more than European Modernism ever had, or for that matter the reigning movement of art in America: Abstract Expressionism. Goings and the other Photorealists were not, however, just a second generation of Pop artists. The early Photorealist subjects that catapulted the movement into the public consciousness were Goings' Pick-Ups, Estes' Store Fronts, Tom Blackwell's Motorcycles and Ron Kleemann's RaceCars. These paintings did not strive to de-contextualize their subjects from their origins, and though they, like the Pop artists, strove to portray Middle-American culture it was lacking the irony of so much Pop. Linda Chase writes, "Although both of these movements used imagery to challenge the sway of abstraction, the Pop artists maintained the artist's subjective relationship to subject matter and the denial of true illusionism. The Pop artists were dealing with images as prototypes; the Photorealist, on the other hand, is interested above all in specificity, in portraying with loving attention to detail the uniqueness of a given moment or situation as captured by the camera" (L. Chase, Ralph Goings, New York, 1988, p. 8). Blue Chip is Goings' earliest masterwork and a hallmark of Photorealism. In it Goings embodies that stunning mirror-view that Photorealism has come to represent.